Throughout the 356 model’s seventeen year run, Porsche gave such colorful names as Model America, Spyder, Speedster, Roadster, Cabriolet, and Convertible D to their open air cars. When the Porsche 911 made its debut at the Frankfurt International Auto Show in September, 1963, no open air version was offered. At the same show two years later, Porsche suggested their future intentions when they unveiled a 1965 912 Targa, however, it would take another year to perfect the concept. When it came time to devise an open-air variant of their 9-series car, Porsche lacked the resources to develop an entirely new body work that could maintain its rigidity despite the lack of a fixed roof. To solve this problem, Porsche spanned the car’s cockpit with a fixed, steel, roll bar, which provided enough stiffness to avert further costly structural alterations to the original coupe design, thus was born a car that was neither coupe nor convertible, but an entirely new creation. The name Targa, which translates to badge or shield, was selected as a tribute to the Targa Florio, an Italian race where Porsche was able to prove its philosophy that power was only one component of winning. On the tight, winding roads of Sicily, high up in the mountains above Palermo, the superb balance and handling abilities of Porsche’s cars allowed them to consistently dominate their more powerful and heavier competition, namely Ferrari. 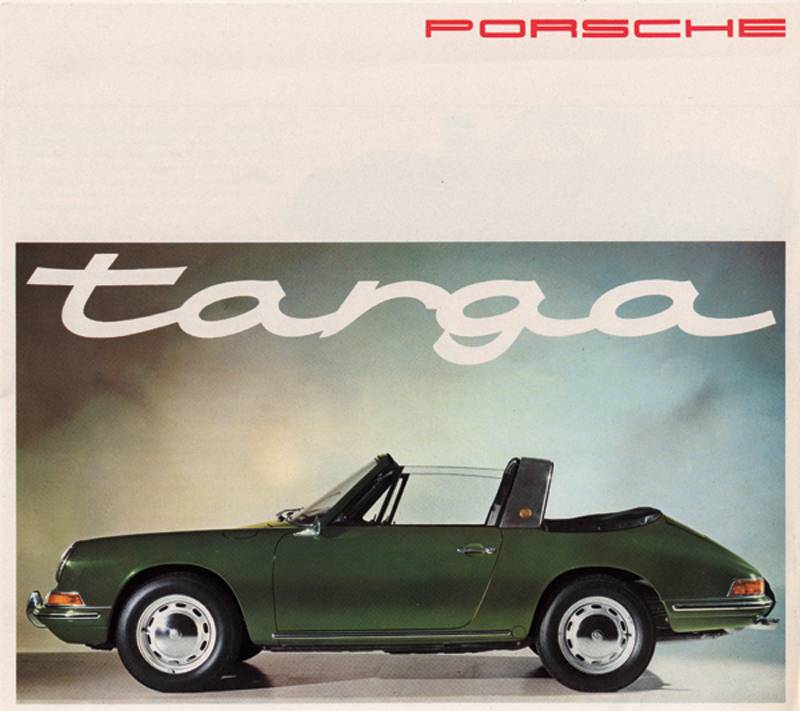 When it came time to name their new open-air car creation, and in keeping with their tradition of devising colorful names for their open air cars, Porsche quickly secured the Targa name as a registered trademark. Another advantage the Targa concept offered, was that it made it easier for Porsche to comply with ever-increasingly stringent safety standards and regulations of the American market, which were especially challenging for convertibles. Although not all purists were satisfied with Porsche’s new “safety convertible cabriolet” its built-in steel roll bar did reduce the rattles and squeaks that are typical with open air cars, and it also reduced wind whipping in the cockpit thus ensuring the dramatic hairdos of the era stayed in place. Consistent with Porsche’s obvious “form and function” design, the steel bar was sheathed in a matte or brushed, gleaming, stainless steel cover with subtle gold “Targa” script. Originally Porsche only allocated 12.7% of its Type 901 series production totals to be Targas (which includes both 911 and 912 models) namely because the Targa was priced higher than the coupes, which Porsche thought would curb demand. As it turned out, the public, and the U.S. market in particular, wanted more Targas, and so production was soon increased. According to Porsche records, 2,562 912 Targas were built, which equates to about 8% of all 912s. All 912 Targas were built at the Stuttgart-Zuffenhausen plant while, whereas many coupe bodies were sub-contracted to be built by Karmann. Most of the Targas coming off the production line at the end of 1966 were 911s with only three 912’s reported. There is a fabled photo of the 100,000th Porsche built, a 912 Targa, shown in ‘Polizei’ (Police) trim. Of the 40 or so Porsches-delivered to Belgium and German Autobahn Polizei, most were 912 Targas. It was late 1967 before 912 Targas were exported to the U.S. These early cars had the characteristic removable “Targa top” that could be folded and stowed in the bonnet. There was an optional vinyl cover that could be wrapped around the top to help protect it when folded. The Targa top may be stowed full open in the trunk, which is what most owners opt for despite how it leaves little room for luggage, as repeated folding and unfolding causes premature deterioration at the fold points. Most early cars came with a “zip out,” flexible, plastic rear window, now commonly referred to as “soft window” Targas, or SWT. Porsche advertisements of the day show the car in four different configurations: top and rear window buttoned up; top off and rear window up; rear window down and top on; and both top and rear window off. Lowering the soft window requires the owner release two tension bar handles located inside the car under the Targa bar, and then unzip the window halfway around and lay it against the inside rear fire wall. Another option for stowing the soft window was a rear storage compartment in lieu of rear seats. An optional tonneau cover can be snapped in place to cover the flexible plastic window and give a finished “cabriolet” appearance to the open space. In late 1967 an optional solid glass rear window became available at an additional cost, thus creating a variant that is now referred to as “hard window” Targa, or HWT. The HWT’s hard glass window could not be removed, but it was a more rugged design, it offered quieter ride, and it had defroster vents which soft window cars lacked, thus vastly improving visibility in inclement weather. Some owners of the early soft window cars converted them to the hard window design. It is fairly easy to spot this modification by the remaining tension bar handle access slots on the underside of the roll bar. Today, many owners of converted cars are seeking to restore them to back their original soft window configurations. By 1969 most buyers were opting for the quieter and relatively maintenance-free glass rear window. 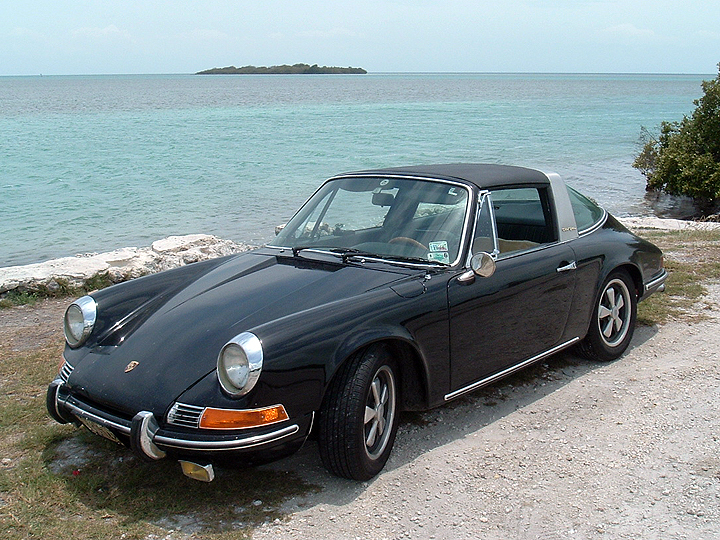 In addition to a longer wheelbase and flared fenders, a 1969 Targa is characterized by vertical air vent louvers near the base of the Targa bar. Porsche has continued to offer Targa variants to this day on its 9-series cars. 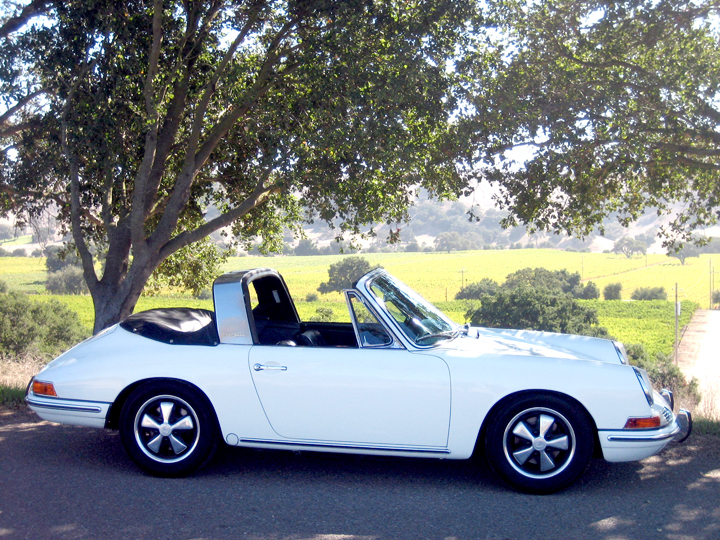 However, it is not known whether Porsche made a 1976 Targa 912E. Rumors abound, and at least one very convincing custom car exists, but so far no definitive original 1976 Targa 912E has come to light. If you believe you have such a car, please contact us! 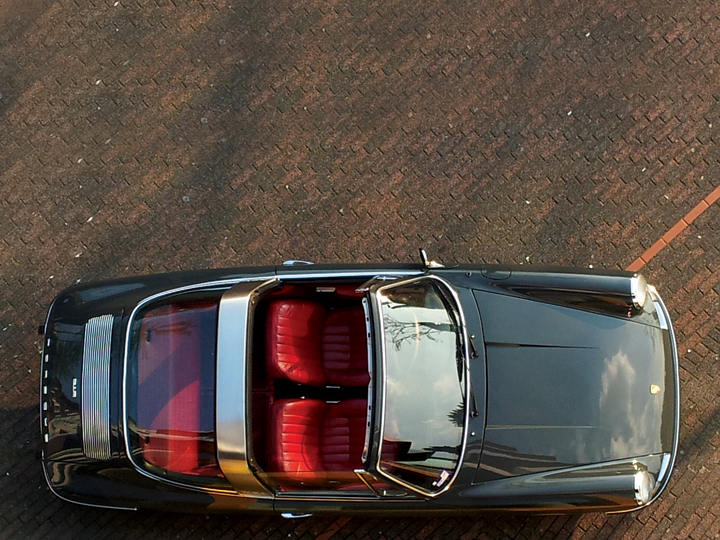 The silhouette of the original Porsche 911 / 912 coupe is among the most beautiful and iconic in all of automotive history, and the Targa is a truly unique and pioneering variation on this theme.